Tamy Emma Pepin was born in Montréal and grew up in the Notre-Dame-de-Grâce neighbourhood. A content creator, TV travel personality and producer, Tamy's range of interests and curiosity know no bounds. She wears many hats with panache, and nothing stands in her way. Following a visit to Morocco, her mother's country of origin, Tamy developed an interest in Berber crafts, including rugs. In 2016, she founded Un peu plus loin, a multi-platform content creation studio that also operates an online boutique. Tamy carefully selects all the items on offer, which are manufactured in Morocco. Never short on ideas, Tamy is already planning to expand her project to other cities around the world. “My dream is to open other multi-functional Un peu plus loin spaces that offer experiences encompassing several of my passions, like culture, design, storytelling and travel.” We’ll be keep a close eye on the latest developments! How would you define Montréal's vibe? Montréal's vibe is a product of its diversity. It's a multifaceted city with a mix of points of view, communities and cultural experiences. At the same time it's very welcoming and friendly. Compared to other large cities, I find that Montréal doesn't make people jaded. It's also a human-scale city whose energy is defined by its inhabitants and diverse neighbourhoods. How would you define Montréal’s sense of design? Diverse and eclectic. You see the good right next to the bad, but there's genuine creative freedom everywhere. Everyone creates their own vision of design, and leaves their own signature. What location, institution or building most embodies Montréal design for you? I'm rarely downtown, but when I do go there, I often pass by the Montréal Marriott Château Champlain hotel, near the Bell Centre. That building makes me happy. Its half-moon shaped windows make me laugh. It's unique, it looks like no other building and it has its own personality. It's like the playful Montréal that I like, and it's a great example of modernism. It was originally designed by architect Roger D’Astous, a student of Frank Lloyd Wright, for Expo 67. He could have stayed in the United States, but he chose to come to Québec and he contributed enormously to Montréal. It's a pity his work isn't better known. For those who are interested, many of his illustrations are on display at the Canadian Centre for Architecture. What Montréal creation do you find truly inspiring? I like Lambert et Fils for the quality and aesthetics of their lighting accessories, and Camille Côté for her elegant hats. I also recommend Never Apart, an important organization in Montréal, for its sounds and textures. Why is it important to you to support local design? Obviously it comes down to beliefs and values, but also because Montréal produces very high-quality things, rivalling any other city in the world. It's important to support local design because it ensures its sustainability. For designers to live out their passions and thrive, there needs to be a market for them. In what way would you say your style is typically Montréal? I don't think it is, actually. Montréal doesn't have a single style. I'd say my style reflects my state of mind. Right now I feel calmer, so I need less excess, less distraction and less noise, and less social media—like returning to what's really essential. That’s reflected in what I wear. I'm going for a more uncluttered look, with high-quality materials and clothes that will last longer. I'm also paying more attention to the “architecture” and form of the clothing. How does Montréal inform your work and creative expression? For me, Montréal's soul is its people. I like to be in the company of people who are able to create freely. I'm lucky to be surrounded by creative minds and entrepreneurs who have equal amounts ambition and talent. They inspire me and help drive my creativity. That's one of the reasons I always come back to Montréal. The changing of the seasons is also important in my creative expression. The seasons mark the passage of time. For example, in winter I spend a lot of time writing, reading and illustrating. In summer, I express my creativity in a much more outgoing way: I go out, I attend concerts, I see lots of colours and textures, I talk to tons of people and I soak up all that energy. Where do you go in Montréal for a coffee? Larrys, which is something of an office to me, although I'm often there for pre-dinner drinks. It's the perfect place to grab a bite, work or go for a date. I regularly dine at restaurants and I often change places. For example, this week I went to Le Bloomfield on Van Horne Avenue. They have organic wine and an excellent à la carte selection. In my neighbourhood, I like going to Via Dante, my favourite Italian restaurant. It depends what vibe I'm feeling. I'm a regular at La Femme Fontaine on Saint-Laurent and Bar Henrietta on Laurier. Their drinks are consistent and always perfect. There's also Magdalena in Saint-Henri, which has excellent cocktails, a great wine selection and delicious vegetarian snacks. I buy a lot online, but I do love Cahier d’Exercice and the second floor of Simons. In terms of local design, Oneself clothes is my latest infatuation. That's my speciality! In summer, I love wandering the back alleys of my neighbourhood, Rosemont La-Petite-Patrie. I live near Jean-Talon Market and I particularly enjoy going there on weekdays, when it's less busy. As I walk around, lots of ideas pop up in my head and everything comes together. I love La Petite-Patrie, which is just steps from Little Italy and the old Italian men sitting on their benches. I often pass by Little Italy Park, which is somewhat unloved, and Saint-Hubert, my favourite street in Montréal. I love the window displays on Plaza St-Hubert. They really make me laugh! Tell us about a hidden spot you’re going to regret sharing with us. The Park Extension, and especially the Greek restaurant Portara. It's great in the summer for the patio. On Saturdays, they have DJs playing songs you'd typically hear at clubs in Greece. I find it really fun! I love the generation of immigrants that settled in that neighbourhood. It's a very rich mixture of cultures. There are still plenty of well-kept secrets in the Park Ex, but that could change with the construction of the university nearby. Now's the time to go there and lose yourself in its streets, before the character of the neighbourhood changes completely. You have a design-obsessed friend coming to Montréal. Where do you send them? For shopping, I'd send them to Les Étoffes on Saint-Laurent and Espace Pepin Maison for interior design. And Habitat 67, of course. And if they're interested in architecture and Montréal's newest developments, I’d send them for a stroll in the Mile Ex. This post has been presented in collaboration with Souk@SAT, avid supporters of Montreal design. 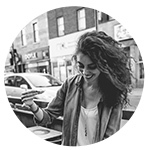 Laure is a writer, community manager and the founder of the blog Une Parisienne à Montréal. She’s also an epicurean globetrotter who’s always on the hunt for innovative concepts and must-try restaurants. In 2016, she co-founded Slow Journeys, a webzine that focuses on ecotourism and design.